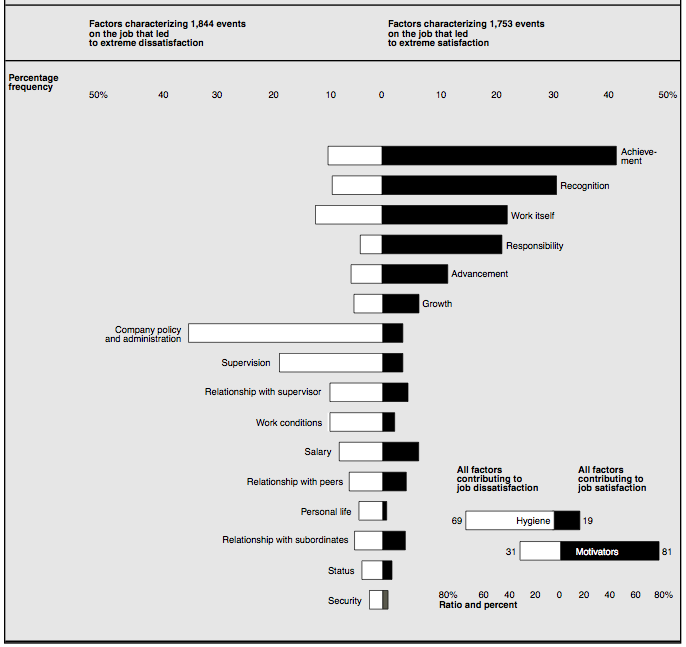 Herberg’s findings on occurrence of factors that lead to extreme job satisfaction or dissatisfaction. Your organization is only effective when they feel like it. Have you coached your management and executive team on how to motivate people around your vision? The company’s bottom line is motivation, their motivation, not yours. A leader holds managers accountable to understand, commit, and own a manager’s role to translate an enterprise vision to their team. Your management’s ability to own their role and effectively translate that to their team is the break point for organization success or failure. Leaders inspire, leaders role their sleeves up to involve themselves in gauging the pulse of their organization, division, their department, their team. Leaders sit with their talent to out how they can lead better. Leaders lead. Managers manage. Both motivate. 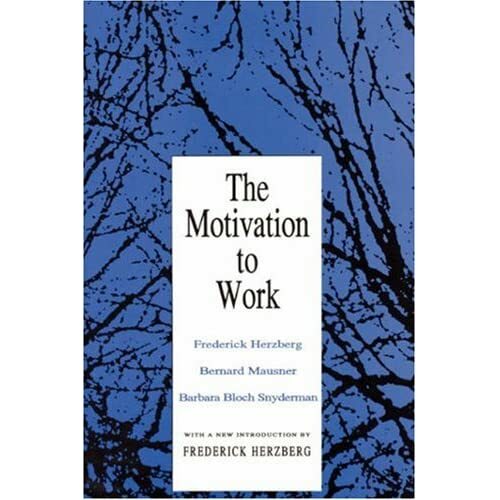 The alpha and beta of motivation in the workplace is Frederick Herzberg’s Motivation to Work study, published in 1959. This 180-page book should reside on every leaders Kindle, iPad, desk, or book shelf. No human resource policy should get written without thorough understanding of this study. What is interesting is achievement is the single most important factor. Someone’s achievement will drive their motivation and their achievement does not need to be recognized to sustain a positive effect. Recognition tied to achievement is powerful; but only in combination with achievement, not separated. In other words being called out for recognition is hollow if the person knows they did not achieve something. And achieving something you know took effort will both bank and sustain motivation longer than other factors. Achievement is intrinsic and intrinsic motivation is the only lasting motivation. Every employee wants to know how they make a difference: how they contribute to the goals of the organization. Whatever strategy you build and announce is immediately translated by each individual as to how your strategy impacts their job and their role. As a leader can you sit at any desk of the organization and confidently hear that that employee knows exactly how they make a difference in the organization and that what they do in their role to deliver to your strategic goals? Do you hope this would happen? Hope is not a strategy. Motivation is the bottom line to success and motivation is your responsibility. You, the leader are the most influential force for your organization’s motivation. You set vision and you set expectation. More importantly you motivate by modeling expected behavior. Each employee has knowledge, ability, and skills; however, without motivation they provide their knowledge, ability, and skills to you only when they feel like it, not when you expect. You are as much a coach as a boss. You are as much a mentor as a boss – and, no, financial compensation is not motivation. Motivation comes from appreciation, acknowledgment, and alignment. If you have not made clear that each manager will operationalize a plan with goals, objectives, and actions and the resources needed to deliver and be accountable for, then you are crossing your fingers – and you are not a leader, but a bully. Bullies hide behind titles and layers of bureaucracy – they perpetuate bureaucracy. Motivation matters. Whether not-for-profit, public-sector, or private-sector motivation delivers bottom line results. Whether a donor’s dollar, a grant, a budget approval, taxpayer dollar, shareholder investment, or revenue – how you maximize each and every dollar depends on motivation. Both motivation and profit measure your leadership effectiveness. Profit without motivation is hollow and will not sustain satisfaction.